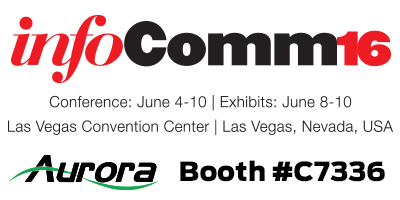 Stop by to see Aurora unveil the new VLX Series Tranceivers and ASP Series 4K Matrixes! Many more new products on display! The VLX Series provides one of the most advanced IP Streaming solutions on the market utilizing Aurora’s IPBaseT™ technology, which synergizes various IP/AV standards to work together as one. It is the industry’s first 4K UHD transceiver with only 1.5 frame (25ms) latency and visually lossless compression. Using a transmitter (encoder) and receiver (decoder), respectively, used to be the standard — until now. The VLX Series can be set up as either one to make installation, inventory, and troubleshooting easier. The ASP-442A/ASP-882A is an HDMI® 2.0A 4×4/8×8 4K 60Hz matrix offering the power and flexibility you need at a cost effective price. Route Ultra High Definition video sources and multi-channel digital audio from any of the HDMI® inputs to the any of the HDMI® outputs at the same time. The front keypad and LCD display are designed for easy operation and quick status of routing while the integrated Web Control Pages allow for remote control from any device with a Web Browser (Tablets, Computers, Smartphones, etc.). 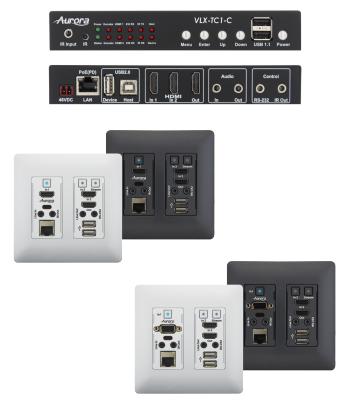 LAN and RS-232 Ports have advanced protocols allowing hot plug detection, signal detection, EDID table loading/recalling, presets, and more. The advanced protocol features and integrated Web Control make the ASP-442A/ASP-882A perfect for commercial applications with auto switching, digital signage with device detection, or residential systems with home automation.